300 ton travel lift for sale has power loading capacity, high efficiency and reliable performance. It has wide application in fields, such as dock, aquatic clubs, water sport meetings, construction site. It can lift the boat out of the water, and can put the boat into the water. 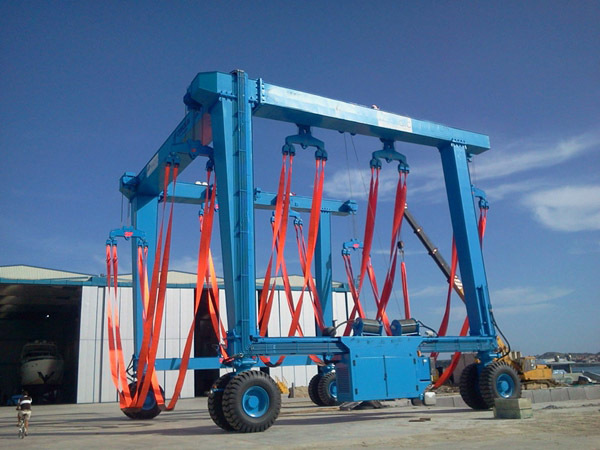 It is also used for lifting and transporting material in workshop. 300 ton boat hoist mode is designed with galvanized steel grilles walkways and platforms. This makes 300 ton hoist crane flexible move, stable traveling and easy maintenance. 300 ton gantry crane itself is heavy, but the durable tyres ensure that the crane can lift heavy vessels or material flexibly, easily and stably. Our company provides 300 ton travel lift for sale. If you want to buy a first-class crane with factory price, just contact us and send quotation to sales@ellsentravellift.com, we will reply to you asap. Travel lifts, also known as mobile boat haulers, are the ideal choice for lifting boats from 15 tons to in some cases up to 1100 tons. 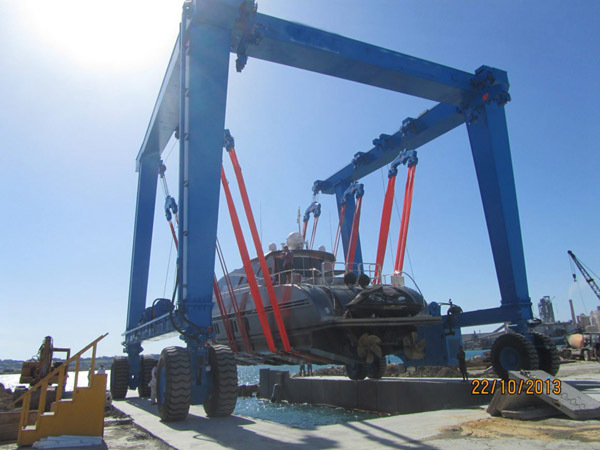 Their versatility in the ability to lift yachts with a variety of docking plans, requires little involvement from divers to check slings before lifting. Please note that it is still important for divers to check interference of the yachts running gear and stabilizers before lifting with a travel lift. The travel lift works by lifting two or more slings connected to cables running to the top of a large A frame structure, perched on top of four wheels. 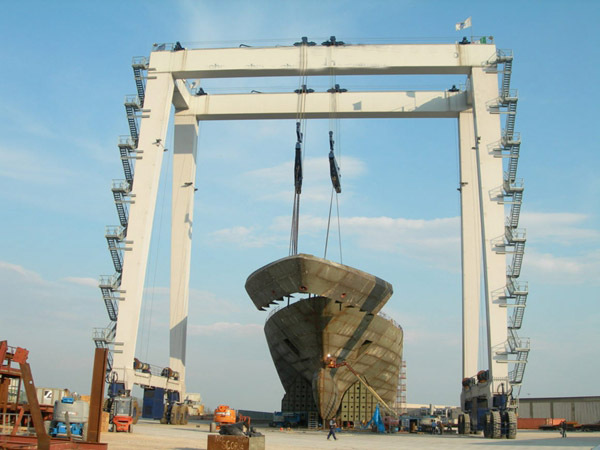 The mobility of the travel lift gives shipyards the ability to lift boats and transport them to a resting spot on the hard, then resume lifting additional yachts. Many other lifting systems limit the shipyard or marina to lifting only one yacht at a time, completing work necessary, then launching the boat before lifting another boat. Who provides 300 ton travel lift for sale? There are many reliable and famous travel lift manufacturers in the world. The largest manufacture of the travel lifts are Marine Travelift located in Wisconsin,USA where they have been manufacturing travel lifts for over 40 years. 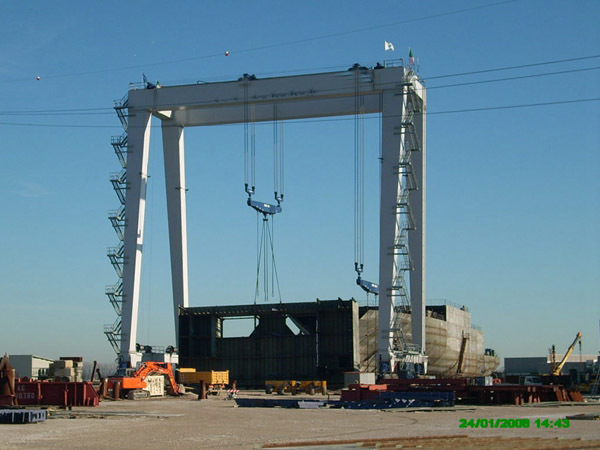 Their largest travel lift is a massive 1000 ton lift located at Colonna Shipyard in Norfolk, Virginia, catering to commercial boats, pleasure yachts and even government work. Cimolai claims to have the largest travel lift in the world at 1100 tons. This travel lift is located at a Nakilat Shipyards in Ras Laffan – Doha, Qatar. This 1100 lift is in addition to a 300 ton travel lift already in operation. Our company is not the most famous travel lift supplier, but still a very professional travel lift manufacturer in China. We provide types of travel lift for sale, such as light duty travel lift, like 25 ton travel lift, 35 ton ship lift crane, 50 ton vessel hoist lift, 70 ton boat hoist crane; heavy duty travel lift for sale, such as 400 ton boat lift crane, 500 ton hoist travel lift, 800 ton construction travel lift, 900 ton hoist crane, 1000 ton vessel lift crane. For specifications, we will consult the customers’ requirements and practical conditions, to ensure that every customer can get the most suitable crane travel lift. We specialize in the manufacture of lifting equipment for the Marine and Industrial sectors, offering a wide range of both standard catalog products and customized equipment, manufactured according with Client technical specifications. 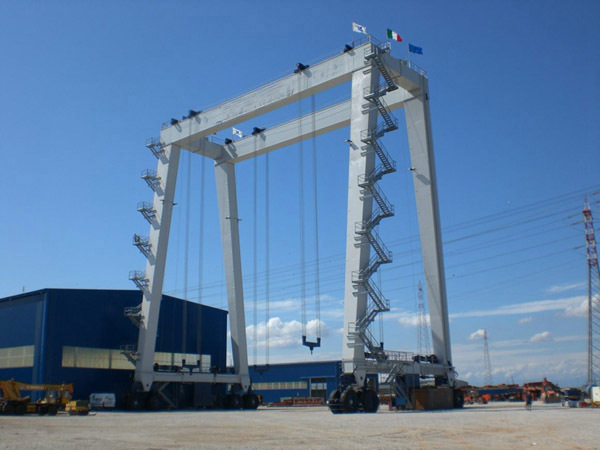 Except for marine travel lifts, we also produce gantry cranes on tyres or rail, overhead travelling cranes, electric chain hoist, wire rope hoist, types of jib cranes, construction winch, marine winch, electric flat transfer cart, straddle gantry crane, lifting equipment integrated in processing lines. Our company has more than 30 years of experiences, an international sales network and a worldwide client portfolio including many countries in all continents. More information about crane and hoist devices on Twitter! 300 ton travel lift for sale is a kind of large lifting device. Safety is an important factor for heavy device. So what should do to ensure travel lift safety? The operator should receive professional training and get operating license. This is basic requirement for the operator. The operator uses the travel lift according to operating principles and operates the travel lift correctly. And customers pay attention to travel lift quality, not only the price. Top quality travel lift can ensure reliable performance and few accident. Daily check work is also important for crane safety. Regular check work can help customers find the problem earlier, and take measures to solve the problem in time. This can avoid damage, protect the crane and the operator from damage, and prolong the crane service term.